While Toei still waits for Andrew Michael Gray, Ciara Hanna and Sayaka Akimoto to arrive in Japan for the filming of "The Prime Minister's Rumored Girlfriend", the latest Shippaiman episode had outraged Joseph Pabaya and outgoing President Nobita Aquino. The episode of Shippaiman showed that Japan's bullet trains were all deteriorating under the watch of Joben Abunami, the transportation secretary of a dystopian Japan. The Prime Minister Nobita hired him based on the padrino system. This week's guest in Shippaiman is Yoshihiro Fukoda. 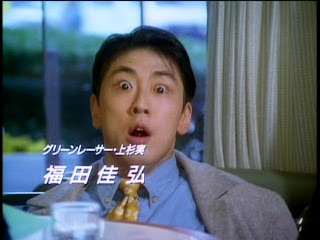 He played as Minoru Uesagi in Gekisou Sentai Carranger. Based on the episode he lost his Accel Changer and where he couldn't morph, the series' current episode showed more lack of judgment on the part of Prime Minister Nobita. In the episode, Shippaiman tries to fix the problems of the train only to result to a major disaster. The Winsbraindraft team now featured both Jules Chikafuji and Takeru Inaba trying out their Solbrain type suits in saving the passengers. During the episode's run, the Winsbraindraft team managed to save the train. In this episode, Manabu Rokuda/Shippaiman tries to save the day only to see his Shippai-suit severely damaged after trying to stop the train himself with improper equipment namely himself. After the episode, the "hero" Manabu is seen in the hospital after a failed rescue attempt. But writers and actor Osamu Okuta said Shippaiman will be healthy enough in the next episode to show more stupid publicity stunts. The whole episode gave an outrage to outgoing DOTC Secretary Joseph Pabaya. He said, "How dare does that episode make fun of me and outgoing President Nobita? It was Gloria's fault that the MRT wasn't finished. Why don't the writers believe it?" said Pabaya in an interview. Episode writer Naruhisa Arakawa just exclaimed, "What a baby!" The episode ended up showing pictures of the MRT deterioration under Pabaya's watch which further caused the outrage of Pabaya. Pabaya called Shippaiman the worst show ever. Unfortunately for Pabaya, Filipinos fed up with him all gathered at the Japanese embassy with presents for Toei Ltd.
Ciara Hanna and Andrew Gray are getting ready to play their parts as guests in Shippaiman. Ciara Hanna will play as Miss America Gia Jordan. Andrew Gray will be playing as Dr. Troy Burrows the sexiest doctor alive. Hanna mentions that playing in Japanese Tokusatsu would be a lot of fun. But they're still waiting for Sayaka Akimoto to return home to Japan so she can play as Pia Wakamatsu. Hanna and Gray were last spotted interacting with the Shippaiman main cast and went to the beach together with the whole cast. Next episode, be ready to see Shippaiman battle the Hanma Gang.